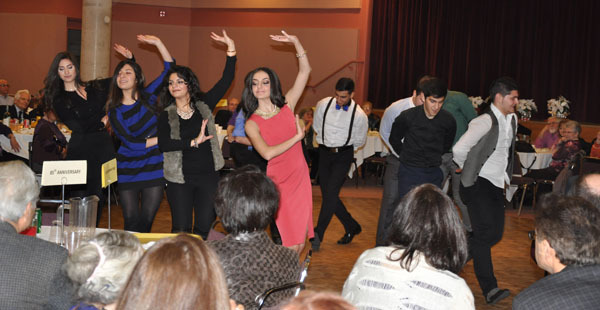 The Annual Volunteers’ Appreciation Party took place on Saturday, January 18, 2014 at “Magaros Artinian” Hall of Holy Trinity Armenian Church. The party was organized and hosted by the parish council’s chair, Mr. Ohan Ohanessian and his wonderful co-workers: Stephan Ekmekjian, Rosin Imasdounian, John Satouri, Sella Kaltakjian, Susanna Harutyunyan, Vigen Allahyarian, Kevork Barounian, Masis Esagholian, Krikor Apel and Bedros Chinchinian. These amazing ladies and gentlemen and their families went out of their way to make sure all volunteers were welcomed and had a great time. The Parish Priest, Rev. Archpriest Fr. Zareh Zargarian and Mr. Ohan Ohanessian each greeted the guests with a warm and welcoming speech, thanked the volunteers for their ongoing support and continuous active involvement, working together united towards the prosperity of our beloved church. This annual gathering brings our committee members close and helps them to get to know each other better and find new friends. Over 30 auxiliary bodies are working actively towards the betterment of this church’s mission. They have a major role in flourishing the religious knowledge, promoting the Armenian heritage and culture and providing the community with numerous humanitarian services. Our doors are open and we welcome you to join over 350 existing volunteers. We pray 2014 be a year filled with peace, love, and prosperity for all. Click to see more photos.